Zinc oxide (ZnO) and copper oxide doped zinc oxide photocatalysts (CuO/ZnO) were synthesized by precipitation method. 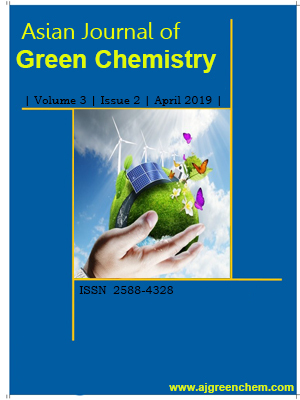 The effect of CuO loading on the physicochemical properties and photocatalytic performance of ZnO in photodegrading methyl orange dye solution (MO) was investigated. The produced ZnO has a crystallite size of 61.1 nm, surface area of 4.43 nm2/g and band gap energy of 3.30 eV. After doping with 0.8% CuO, the crystallite size decreased to 19.4 nm while the surface area increased to 8.2 mm2/g. The band gap energy, however, remained the same indicating that low CuO content did not affect the optical properties of ZnO. The efficiency of the photocatalystsin photodegrading MO was evaluated under different conditions. Photocatalytic activities showed that the highest removal of 54.1% was achieved when 5 ppm of MO solution was degraded by 0.6 g of 0.8% CuO/ZnO at pH 6.8. The response surface methodology (RSM) was employed to develop a quadratic model as a functional relationship between the amounts of the degraded MO (mg/g) and three experimental factors (mass loading, MO initial concentration and MO initial pH). The highest amount of the degraded MO was 12.8 mg/g when 0.2 g of 0.8% CuO doped ZnO was used in 5 ppm MO at pH 5.